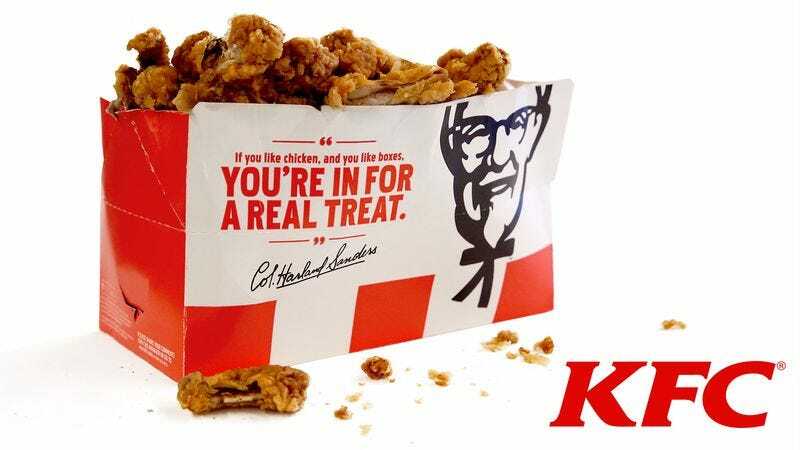 LOUISVILLE, KY—In an effort to meet the changing demands of its consumers, fast-food chain Kentucky Fried Chicken announced Wednesday that it has begun offering customers the option of purchasing, at a significant discount, a 20-piece box of pre-owned hot wings. “Sure, these wings are a little bit older, and the package may have a couple dents in it, but they’re a lot more affordable than the brand-new ones,” said Kelly Lipscomb of Minot, ND as she stopped by a local KFC to try the gently used menu item, which varies in price from $1.99 to $6.99 depending on how many weeks ago the wings were prepared. “You can lay down 14 bucks for those fancy new hot wings, but those things start to lose value the moment you drive out of the KFC parking lot. Money-wise, it just doesn’t make a whole lot of sense. Besides, these used ones still got plenty of meat left on the bone, and to be honest, they really don’t taste all that different than they do when they’re new.” Company officials confirmed that KFC customers will also be able to purchase a discount value meal that includes previously owned hot wings, a secondhand medium soft drink, and a certified 2012 homestyle biscuit.